The 2013 FCI World Dog Show saw purebred dog enthusiasts from 5 continents, with some 18,000 dogs representing 371 breeds, descend upon the sprawling Hungexpo Fair Center in Budapest. Clear blue skies and Eukanuba's trademark shade of pink provided a colourful backdrop for an exciting 4 days of competition and camaraderie among dog fanciers from around the world. If you couldn't make it, the show's proceedings were able to be enjoyed from the comfort of home! Live-streaming of the main ring including groups, junior handling and the World Challenge European finalist event were available for free on the Eukanuba website. Combined with Mike Bloxsome's ringside interviews, it was the next best thing to actually being in Budapest! There is even the chance to catch up on the company's official Youtube channel because the group judging and the interviews from Budapest will be available on www.youtube.com/eukanubaeurope. Adjacent to the bustling main ring was the 300 sq. metre Eukanuba trade stand, which became a popular meeting point throughout the week. Its prime location not only offered front row viewing for all the group ring action but the chance for weary travelers to replenish their energy in a fun and entertaining space surrounded by friends and familiar faces. One friendly face that particularly stood out for Best in Show judge Dr Tamas Jakkel was that of Ch Bottom Shaker's My Secret, the gregarious Old English Sheepdog from Hungary who was declared top dog in Sunday night's finale! Runner-up was the graceful Finnish Lhasa Apso CH Chic Choix Cleopatra Eurydice, whose sleek golden tresses sharply contrasted the Bobtail's bohemian style. Much to the joy of the brand both Jimmy and Elviira are fed on Eukanuba! On the third day in Budapest, a special event was held to select the 2 European Qualifiers who would go forward to compete at the EWC Final. Respected international judge Mr Laurent Pichard of Switzerland had the enjoyable job of evaluating 17 of Europe's best show dogs, and after careful consideration found his winners to be the Bracco Italiano from Malta CH Ciclone, and the black and white Phalene from Latvia named CH Magic Sunrise Great Gentleman. Again, both dogs are fed on Eukanuba! The wins entitled both dogs and their respective owners to an expenses-paid trip to Orlando, Florida in December! To successfully orchestrate an event of this proportion requires countless months of hard work and planning. Mr Andras Korozs, president of the Hungarian Kennel Club, had the challenging role of main organiser and by all accounts he and his team accomplished their goal in great style! The WDS in Budapest managed effectively to balance the glamour of an international competition with the accessibility required to make the experience pleasant for dogs, exhibitors and spectators alike. Those who attended will surely be left with wonderful memories of a well-organised and thoughtfully conducted show. 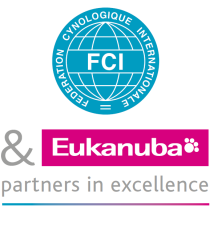 Bringing dogs and their people together is what the world of dog show is all about, and the evolving collaboration between Eukanuba and the FCI continues to make that world a more enjoyable place to be!